Knives, axes, saws, machetes and any other tool with a sharp edge or point. I have been waiting for about 3 years for a Skookum Bush Tool from Rod Garcia and for right at 2 years for a SPL knife from Steven Long. Both of which were slotted to be my neck knives while I was out in the woods. Unfortunately, I am still a ways down the list for both of these creations so I finally decided that I needed to get something that would fit the bill until I got either of these customs. After searching the Internet and messing around with several different knives I set my heart upon a Scandi grind of some sort that had around a 4 inch or less blade, but was full tang and had a good handle to do minor wood processing and carving. What I found that I really thought would work well was the Helle Harding. On Amazon these knives are around the $140 mark, but I got mine at a local shop for $125. This definitely fit within my price range and the size, feel and weight were exactly what I was looking for. The stacked handle adds almost no weight to the knife overall and the blade itself feels quite light and agile in my hand. 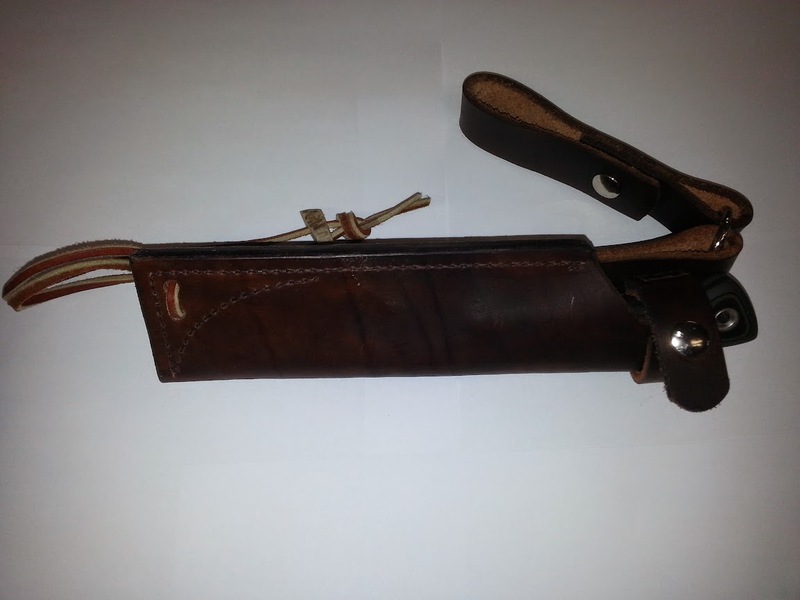 The sheath is real leather and there is a retaining flap that locks the knife in place when sheathed. This really gave me increased peace of mind that I could wear this all day long and not worry about losing the knife somewhere along the way. Everyone is going to have to forgive my pictures. Like almost every outing I have, I leave my phone in my vehicle and almost never take a fully charged camera with me. It has gotten to be an almost impossible task for me to remember that I need to take pictures. Because of this you guys are going to have to suffer with my impromptu photo session on my lunch break. 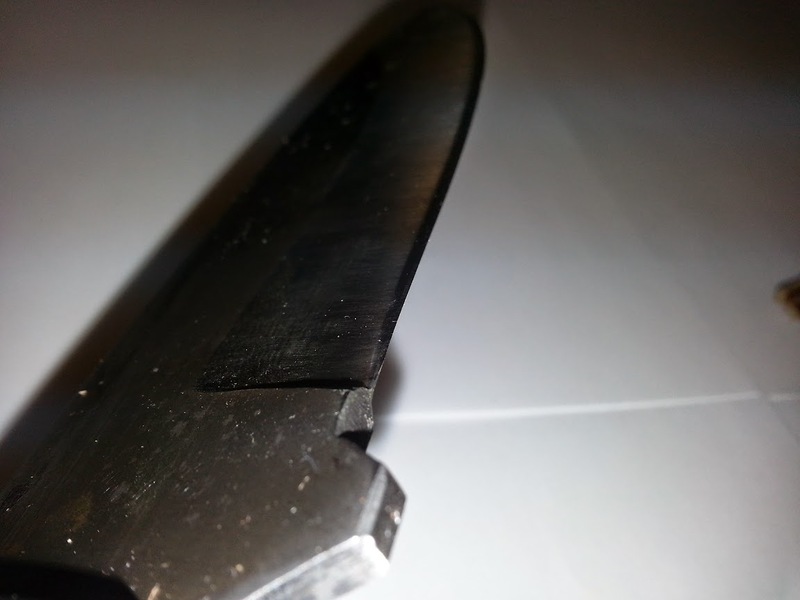 I think even these pictures will allow you to see how well this knife performs on even the least perfect of situations. Over the years I have become quite the fan of Scandi grinds. What I love most about them is how easily they cut through wood and make curls for fire starting. I am not sure if it is just how I use a knife or if it works this way for everyone, but I exert far less energy and pay way less attention to my technique when using a Scandi grind. These pictures will show you how easily I was able to make some feather sticks with a less than desirable wood choice. Considering this was all done during my lunch break, I was very happy with how well it sliced right through this water logged dead branch without chipping it up too much. Again, it was not a wood choice I would have made if I was not desperate to take some pictures for this post. Mind you that this wood was at the initial starts of being punky. It was really right in that perfect spot where (if it was dry) you could make a very efficient bow drill set out of it. As a matter of fact I am going to set it aside and let it dry for a while, then carve out a spindle and hearth. With almost no effort at all, this guy just sliced right through the wood and made nice curls. Most of them broke off at the end as you can see, but each cut curled multiple times. 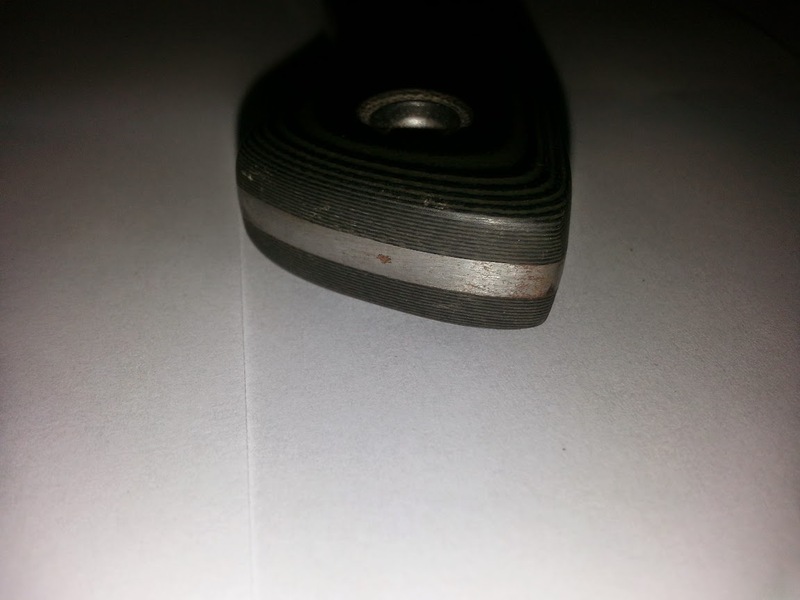 The sweet spot on this blade seems to be the entire cutting surface. There are no areas that seem to cut worse or better than another. It will be interesting how it performs once it dulls several times and I have to resharpen it. If it can keep the current cutting efficiency even after multiple sharpenings, I will be quite impressed. Here is a better look at both the knife and how it cut this very brittle branch. The knife also works very well for field dressing animals harvested in the field. Well, it works quite well for the ducks I tested it on. I could see this as a field knife that would handle any task thrown at it, although like all general purpose items it would not excel at every task. Overall I am quite impressed with this buy. The grind on the blade is a very capable feather stick maker, the agile feel to the blade allows for fairly intricate carving (although I am horrible at carving and refuse to show my poorly made spoons to anyone), it works fairly well for game processing, and the weight is negligible. If anyone I run into is looking for a mid sized knife to use for general camping chores I will now recommend this particular knife. Now that I have picked this up I am concerned that I will have a hard time choosing between this and the two customs I have on order. Too many options!!!! This entry was posted in Edged Tools and tagged camp knife, field knife, general use, Helle, Helle Harding, knife, neck knife, Scani knife on November 13, 2015 by Woodsbum. Due to a surprise opportunity to snag up a Turley parang this last weekend, I decided to do a quick post on parangs before mine showed up in the mail. Once my Turley shows up I will do a quick post on it as well. There seems to be a lot of talk on various forums and websites about chopping style knives, machetes, parangs, cleavers versus axes. These discussions always seem to get a bit heated and end up with coming to the simple conclusion that there is no one best knife, only the best knife for that person. Parangs seems to be collective term for short swords, big knives and machetes that come from Southeast Asia. There are many designs that fall into this category to include bent bladed machetes, straight blades, oddly curved ones, etc. Here are a few pictures of blades that are considered parangs. There really is a huge variance in the shapes and handles. The one I just picked up has about an 8.5″ long handle and 7.25″ blade. The blade is 1/16″ 15n20 steel and has a fairly simple convex grind. No matter what the shape of the blade and handle, parangs are designed to have a very specific area of the blade for various tasks. The front is usually designed for skinning, middle for chopping, and part toward the handle is for carving. Sometimes the back edge is sharpened as well for shaving/processing wood for fire. Parang handles also have a larger end around the pommel so that your hand doesn’t slip during use. The materials also tend to be those that are a bit more textured to alleviate slippage. The nice thing about these designs is that there is no hard and fast rule. You can design something that fits the 3 distinct cutting areas, has a longer handle, and the blade is from 6″ to over 24″ long and call it a parang. 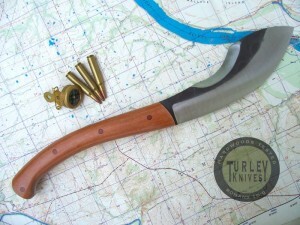 Once I get my Turley parang in the mail, I will do a review of it and let you know how it works in comparison to a machete. Although I am not a parang fan, I am not a parang hater either. It will be interesting to see how it functions during hard use. This entry was posted in Edged Tools and tagged chopper, chopping knife, field knife, knife, parang, parangs on September 8, 2015 by Woodsbum. Finding new and exciting tools to play with is almost an obsession for us “outdoorsy” types. New styles of axes, knives, saws, and the sort are always sought after and prized. 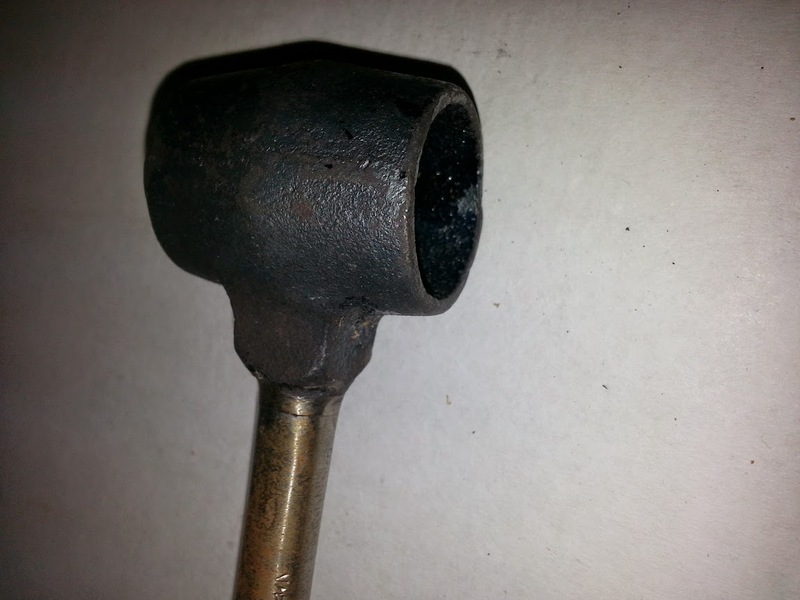 A couple years ago I found a hand tool that I had never known about. 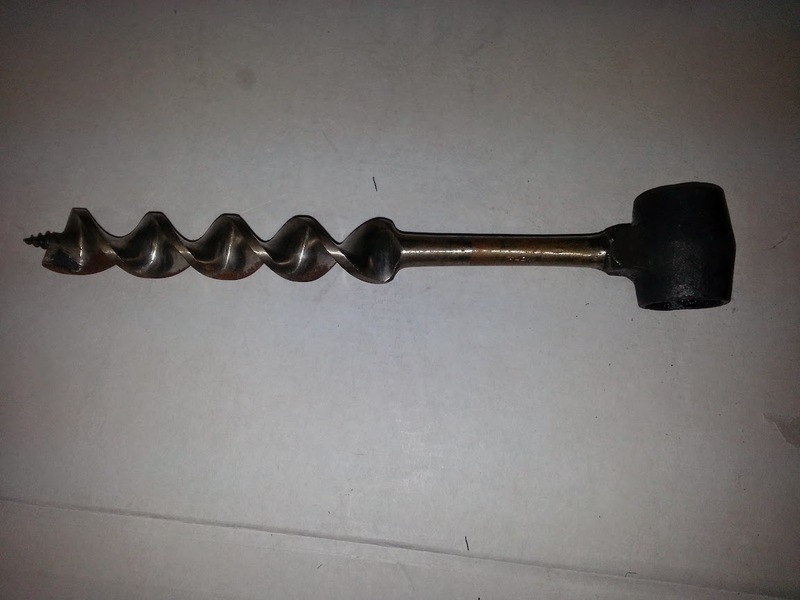 The Scotch eyed auger is a sort of drill that can be used to drill holes in wood for such projects as stools, mallets, etc. At the end of this post I included two videos of people building nice projects with theirs. Unfortunately I have not built any “project” items with mine, but use mine for building cooking frames, drying racks, or privacy shelters while out in the field. I don’t tend to take pictures of those. Once you see the tool and how it is used, you will see the countless uses you would have for such a tool while in the field. Here is what a Scotch eyed auger looks like. It has a large eye at the top for inserting branches into as a way to make a handle. The end is just a screw point and cutting surface that is surprisingly sharp and easy to sharpen. Very simple idea and concept, but also very effective. Again, the possible uses are countless. Here are two videos of people using an auger to make different projects. Tools such as mallets in addition to the framed structures I make for around camp are simple with one of these augers. I have also seen people make various different types of camp furniture with these things. The sky’s the limit!!! Enjoy the videos I found. If you want to buy a Scotch auger, EBay and UK Amazon are your best bets. I got mine shipped from the UK for about $20 total price. 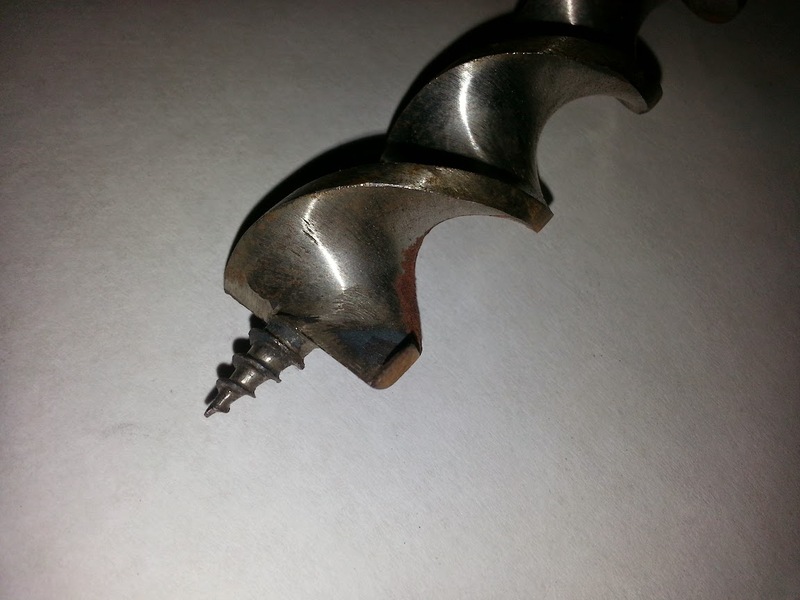 This entry was posted in Camp Techniques, Edged Tools and tagged hand drills, Scotch auger, Scotish auger, Scottish auger on February 13, 2015 by Woodsbum. Well, it appears that another legend has passed away. 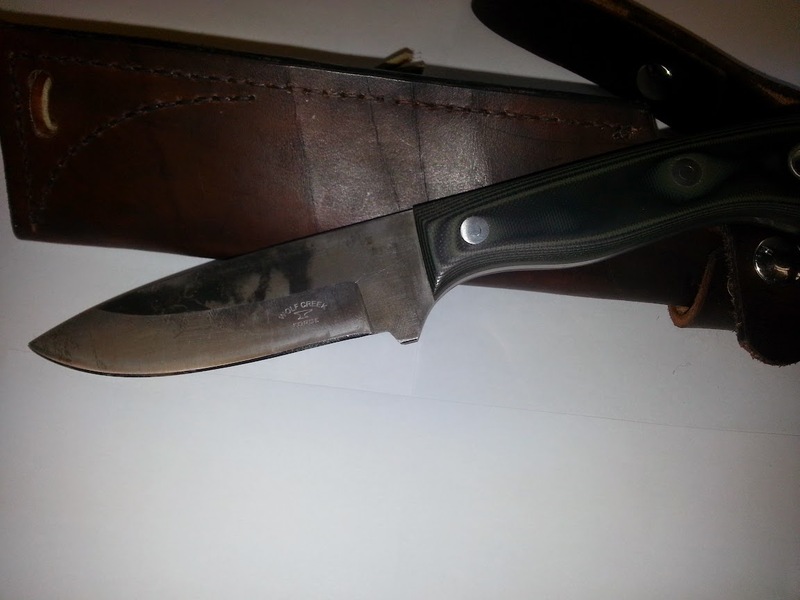 Chuck Buck was the grandson of the Buck Knives Company founder Hoyt Buck. It appears that he passed away Friday evening (Feb 6th, 2015). I saw the notification on Buck’s Facebook page. “Chuck is the son of Al Buck and grandson of Buck Knives founder, Hoyt Buck. From a young age,he worked his way up through the company serving as President and CEO for many years, before handing over the reins to his son, CJ. Chuck now serves as Chairman of the Board. “My grandfather, Hoyt Buck and my dad, Al Buck founded this company on a simple premise, to make a better knife. Our longtime, best-selling knives reflect that tradition. But we also recognize the importance of keeping pace with changing times. As we look to the future, you can be assured that the same attention to quality, performance and craftsmanship will continue. I grew up with Buck and Gerber knives as the “go to” tool for any cutting job. My children’s first hunting knives were Buck and my wife got a Buck 119 as part of a Valentine’s Day package one year. Even though I have moved to more expensive and custom knives over the last several years, Buck knives will always be a part of our family’s outdoor history. My heart and prayers go out to the Buck family. This entry was posted in Edged Tools, Miscellaneous and tagged Buck, Buck Knives, Chuck Buck, RIP on February 9, 2015 by Woodsbum. Not that I am revealing any great secrets here, but I am a bit of a knife freak. I love the simplicity and functionality of a good knife. In all seriousness, knives have saved my hind quarters more than any other tool I use. Due to this harsh reality of me doing stupid things that require solid tools to bail me out, I have NO problem spending large sums of money on quality knives. Enter…. 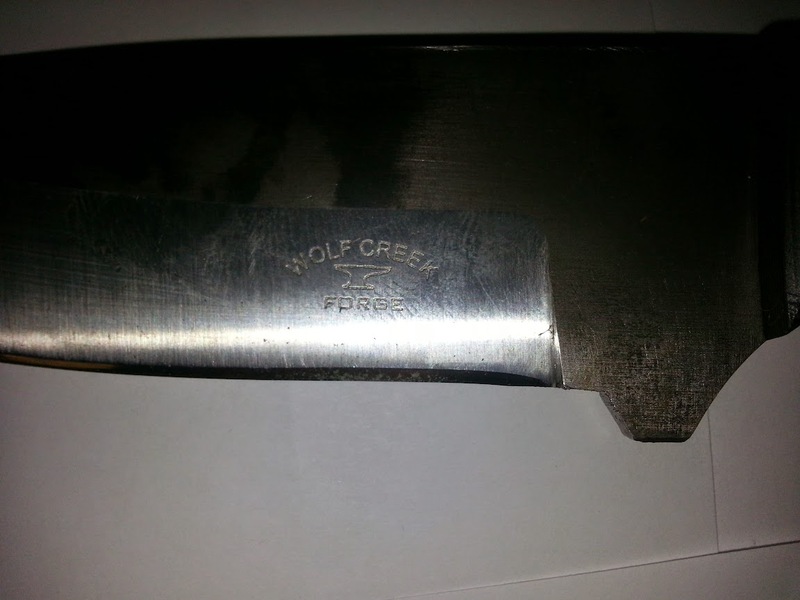 The Wolf Creek Forge. This was actually my first custom knife that I purchased. I have taken more than my share of production knives and customized them, but until I got this I had never actually purchased a hand made knife. I got this used (because that was what I could justify on a knife) so I don’t have many specs at this time. I contacted the maker to see if they did and will update this post if/when those specs are sent. Instead, I will look at the knife and tell you about it from a use perspective. First off, this knife has seen a fair amount of field use. If you look at the pictures it is fairly evident from the small rust spots and discoloration at the tip from batoning/prying wood apart with it. Yes, there are a few rust spots. Remember that I live in a VERY wet part of the country where I swear even iron rich blood will rust in your arteries. Because of the way the sheath is made, I use this knife a lot while backpacking. The belt loop will actually fit all the way around the webbing on my Osprey waist belt. This makes it really nice to access when wearing the pack. 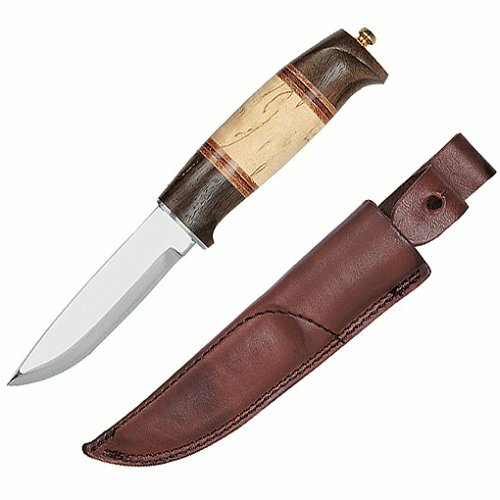 Even though I am not fond of sheaths that use a snap for knife retention this knife fits quite deeply into the sheath pocket. It makes inserting and removal from the sheath quite easy, especially when fighting with bulky gear. In order for my knives to stay relatively rust free I spray oil down my knife sheaths. This keeps them conditioned and helps with the squishy environment in which I live. Unfortunately, it doesn’t always work so keep that in mind while checking out my pictures. Most of the “patina” and discoloration occurred during field use over periods of time where I had no access to oil, polishers, etc. Remember…. I USE my gear, but don’t ABUSE my gear. Most knife makers will tell you that high carbon steel knives are going to get discolored if you use them. The micarta handles actually hold up quite well to heavy field use. You can see where I have knocked the handle around a bit while out in the bush. The only complaints I have at all about this knife is the fact that it doesn’t get as sharp as many other customs I have nor is the spine squared off so I can use it with a firesteel. It gets sharp, but not that hair popping sharp that you get with Adventure Sworn or Turley customs. I have been looking and I think that it has to do with the way that they are ground. This guy will stay the same sharpness for what seems like FOREVER without getting dull. It just won’t get quite as sharp. My Adventure Sworn will sharpen back up to crazy levels quickly, but it will dull quicker than this one does. The same goes with my daughter’s Turley, my Matt Paul, son’s Primitive Edge, the SBT I used for a while, and a few others I ran across in the bush. This characteristic really makes this knife a great field choice for hard work. I tend to use the heck out of it during a trip and just strop it as needed on the inside of my belt. This works wonders. All said and done, I like this knife for hard use camping. It doesn’t need as much care or upkeep as other bushcraft knives I have or have used. Feather/fuzz sticks, split wood fires, general use cutting, prying, cleaning fish/grouse, are all easy chores for this guy and it does its job well. I could think of numerous other, higher priced knives that don’t do as good of a job as this does. 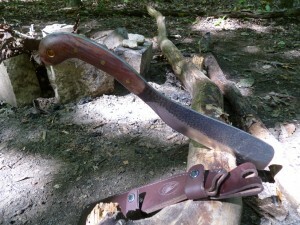 I would recommend this as a great all around knife for those new to bushcrafting. It does everything you would want it to do and does it without making you modify your techniques. Really and truly it is a great and solid knife. 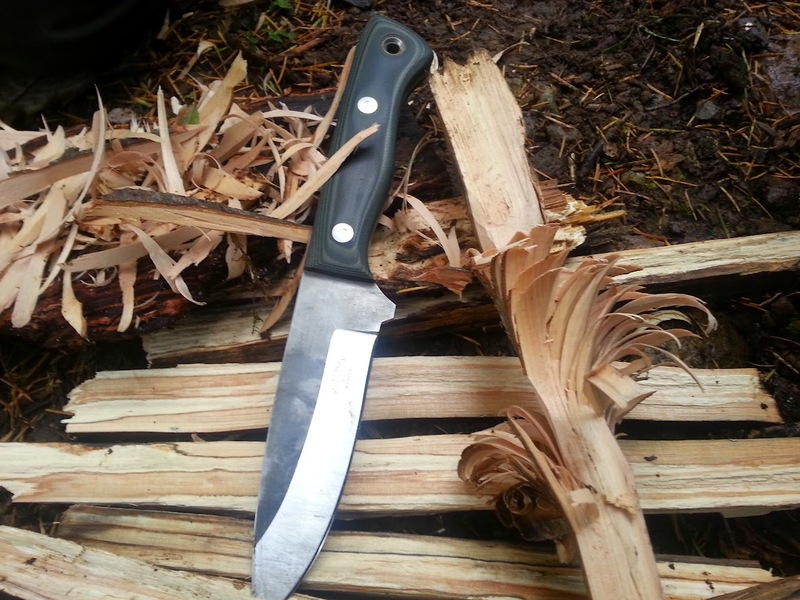 This entry was posted in Edged Tools and tagged bushcraft knife, bushcrafting tools, custom knife, knife, knives, WCF, Wolf Creek Forge on February 2, 2015 by Woodsbum.